Hawaii Native Status: Introduced. These naturalized wildflowers are native to the tropical Americas. Description: The small, fuzzy, rayless flower heads are in dense, almost flat-topped clusters. The leaves are light green, opposite, toothed, sparsely to densely hairy below, and elliptic-oblong, triangular, or egg-shaped. 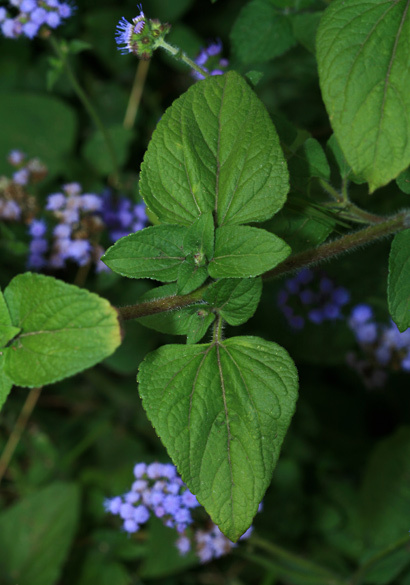 The stems are weak, erect to decumbent, and sparsely to densely hairy. 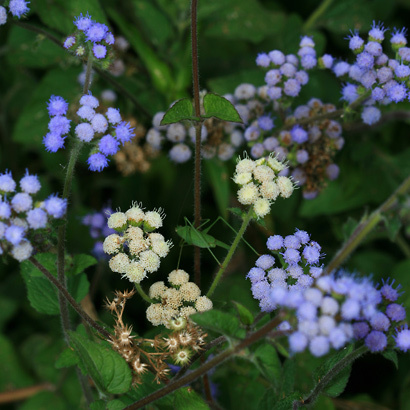 Two very similar Ageratum species are found here in Hawaii and can be difficult to distinguish. Tropical Whiteweed (Ageratum conyzoides) is a taller plant and has leaves with a gland-dotted lower surface, while Bluemink (Ageratum houstonianum) is lower growing plant and does not have a gland-dotted lower leaf surface. Cultivated varieties of Bluemink are typically much lower-growing and have a mounding form instead of an upright form. 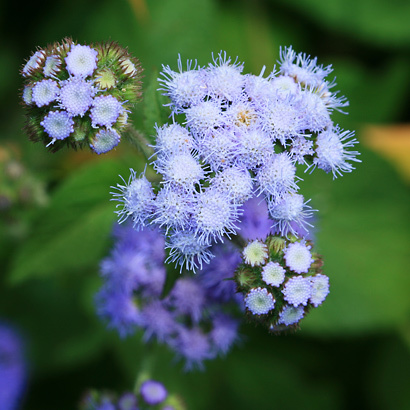 Here in Hawaii, both Ageratum species grow as weeds in disturbed areas and along roadsides at lower to middle elevations. 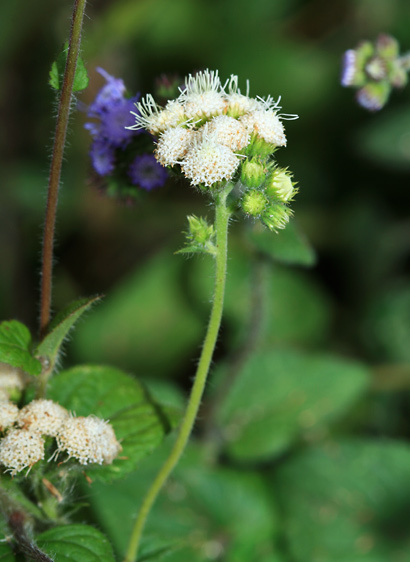 Both Sticky Snakeroot (Ageratina adenophora) and Spreading Snakeroot (Ageratina riparia) look similar to Ageratum, but these two plants have white flowers and purple stems. Foul-smelling – The foliage has an unpleasant smell.